Ina Scharrenbach welcomed CITEC researchers who invented a pair of intelligent data glasses. With their smart glasses project (the so-called “Adamaas glasses”), researchers under the leadership of Professor Dr. Thomas Schack from the Cluster of Excellence CITEC were recognized as the 11 most innovative prizewinners in the 2018 “Landmarks in the Land of Ideas” competition from North Rhine-Westphalia. 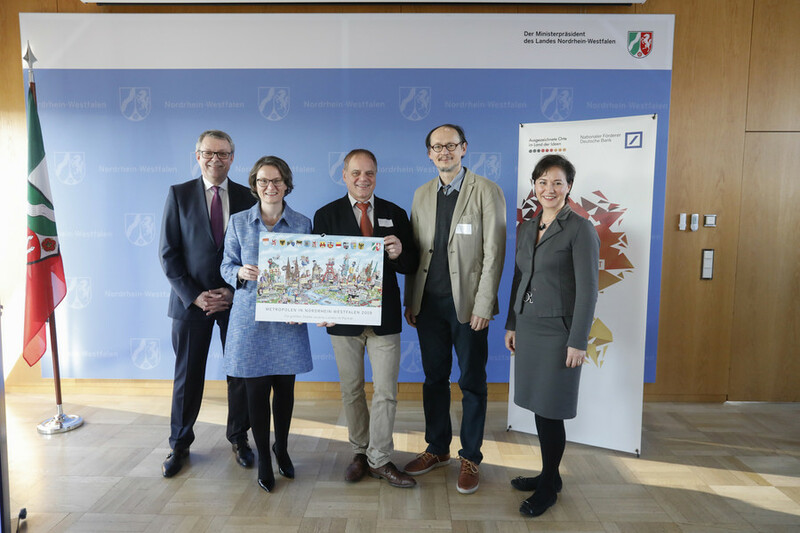 To mark this occasion, Ina Scharrenbach, Ministerin für Heimat, Kommunales, Bau und Gleichstellung (Secretary of the Interior, Municipal Affairs, Construction, and Equal Opportunities), received the 11 prize winners at the State Chancellery in Düsseldorf. The Secretary praised them for their model engagement and exemplary achievements. “I congratulate the 11 prizewinners from North Rhine-Westphalia, who bring people together with their projects. You are pursuing new and innovative paths that strengthen social unity. It is with your ideas that you make our country a landmark place in so many respects – and we can be proud of this.” A high-profile jury chose the Adamaas glasses from around 1,500 submissions as one of the 100 outstanding projects that exemplify this year’s motto of “Connecting Worlds – Strengthening Unity” in Germany. The initiative “Germany – Land of Ideas” and the Deutsche Bank have been holding this innovation competition for 13 years. Instead of tediously searching for the right part while flipping through the pages of an instruction manual, the intelligent glasses of the Adamaas system directly display the step that comes next in the user’s field of vision. This goes for everything from operating a coffee machine to building a birdhouse, along with a set of other practical tasks. The glasses work by recording and taking into account the users’ abilities and the conditions needed for the activity. Based on this, the glasses then give feedback for individualized learning processes. In combination with “computer vision” and augmented reality, the system is able to autonomously recognize objects and the steps of an activity, providing appropriate assistance directly in the display of the glasses. “Germany – Land of Ideas” is a joint initiative of the Federal government of Germany and German industry as represented by the Bundesverband der Deutschen Industrie (BDI, Federation of German Industries). The Deutsche Bank has been a partner since 2006, and is a national funding partner for the “Landmarks in the Land of Ideas” competition. The goal of this initiative is to elevate the visibility of innovations in Germany both at home and abroad, and to strengthen the performance capacity and future viability of the location.